The finished product. 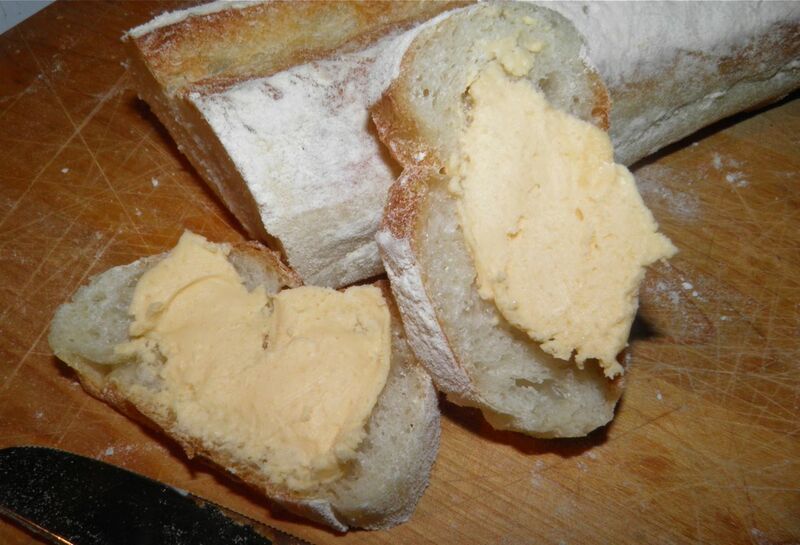 I used a little less cheese to make a spreadable cheese. See the directions for what I did. All the cheese will make it sliceable. The bread is one of my baguettes from yesterday's post. One of the things that irks me – and there are many – are foods that can’t even legally call themselves by what they pretend to be. Tops on my list? Processed cheese “food” slices. cream of tartar and flour. Look on the label. That’s what it’s called. It’s got so much other stuff than cheese in it that it has to add “food” to its name to be marketed. Yum... and what the heck are modified milk ingredients? Milk is milk, is it not? 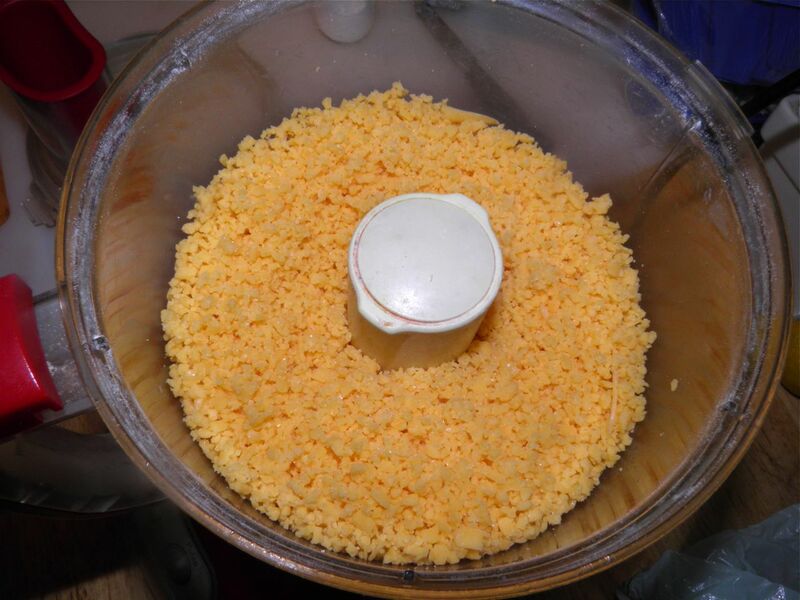 When I make cheese I use regular milk, rennet, and bacterial culture – nothing more. I stumbled on this basic recipe for rescuing what is called “American cheese” and thought it was interesting. My source stated it originally came from America’s Test Kitchen (ATK) but had been modified. I would say no better original source could be cited. I love ATK. I have changed the recipe from what I found and did not go looking for the ATK source so I don’t know how close this is to theirs, but i would imagine it’s just slightly further from, rather than closer to, theirs. The hot milk is when the magic happens. The recipe states 3/4 of a pound of cheese, but I reduced the amount to 1/2 pound. I wanted a more spreadable cheese. Use the full 3/4 lb for an end product you can slice. Second, I changed the cheese to cheddar from colby (nothing more American than that, right? **), and also added a couple shakes of hot sauce, just for some life. I have to admit this tastes like cheese slices. Whether you agree with me that is a good thing or not, you have to admit that there’s no substitute for those thin slices of “fakiness” on top of a hamburger. I think this turned out pretty well. Our Bouvier, Henry, agrees with me. Drool was everywhere... We often buy cheese slices for him for a snack/reward/because we love him. This was quick and cheap to make, too. I would say for the cost of a piece of cheese (about $5-6) I have the same volume of 30 or more slices of processed cheese food which would potentially cost about $10. That’s a significant saving. So not only will you be saving money, but you can rest assured in the knowledge you’re eating something with all of the taste, but none of the weird stuff. Interestingly, this recipe is quite similar to a "Three-Way Cheese Ball" recipe I used to do at Christmastime for parties. I've had that recipe for decades. in the picture, for scale. 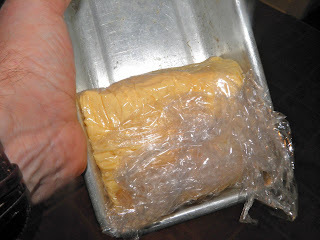 Line a small loaf pan with plastic wrap with the edges hanging out over the sides. Combine the 2 tbsp of milk and gelatin in a small dish or cup. Grate the cheese and place it in a food processor. Add the salt, flour and cream of tartar and process until well combined. Heat the milk until it is scalded (small bubbles form at the edge of the pot). With the motor of the processor running add the milk in a thin stream. Process until smooth. 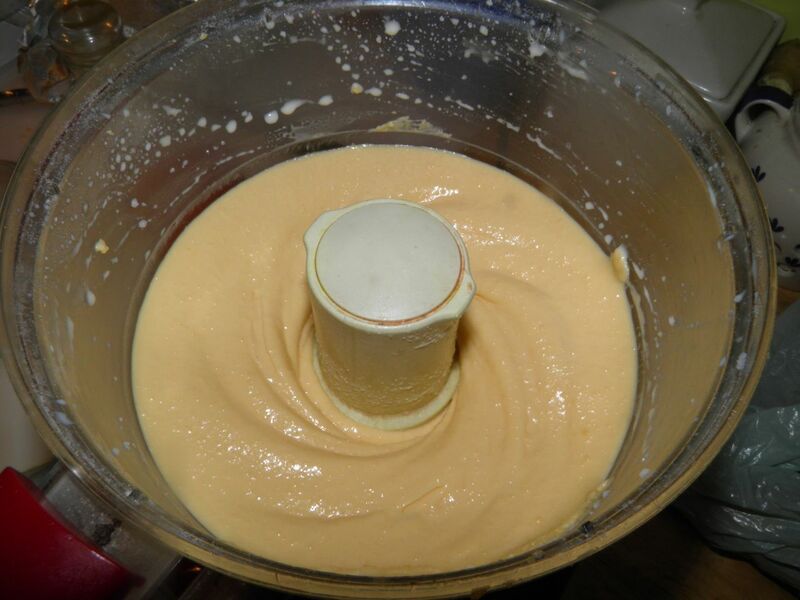 Add the softened gelatin and process again until smooth. Pour into the lined pan, taking care to not have any air bubbles. Fold the plastic wrap up over the cheese and shape into a square. Refrigerate until ready to use, at least overnight. * For a spreadable cheese use 1/2 lb (or about 250 g). That’s what I did. ** Cheddar cheese is named for the village of Cheddar in Somerset, South West England where it was first made.